The Dynamic Subdivision system contains alternative functions to ZBrush’s Classic Subdivision Surface mode, allowing you to apply dynamic smoothing to your models without actually dividing the polygons. This feature is mainly designed to work in association with the ZModeler brush and low polygonal models. 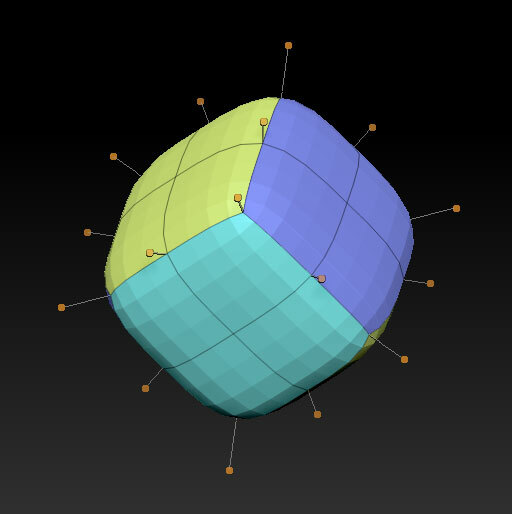 The default Dynamic Subdivision mode is similar to the classic subdivision surfaces previously used by ZBrush. Applying a single subdivision level with Dynamic Smooth Subdivision mode active gives the same result as simply subdividing the model once in previous ZBrush versions. The main difference between the two systems is simple: Dynamic Subdivision mode is used to represent the result of a smoothing your base mesh, letting you see what the divided model would look like even while you actually edit and sculpt the lower resolution mesh. While working with Dynamic Subdivision active, you see the higher resolution surface while your brushes operate on the lower resolution base mesh. As with the classic Subdivision system, Dynamic Subdivision surfaces can be altered with creased edges. However, this new mode also offers a wide range of other options that drastically change the visual results of smoothing: chamfered edges, non-smoothed subdivisions and more. Dynamic Subdivision is applied to the model in real-time. While the function is active, any changes in the base mesh topology will show an immediate result in the displayed smooth surface. Using functions like QGrid and its options (Bevel or Chamfer) will allow you to model objects while having real-time dynamic chamfers or bevels applied to them.